Meet Maria Carillo-Marquina. 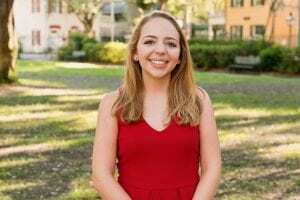 She’s a rising senior double majoring in arts management and art history and a student in the Honors College. For nine weeks this summer, Carillo-Marquina is getting paid to work as a research and interpretation intern at the Whitney Museum of American Art in New York City. She says she’s thrilled to be gaining experience within the museum industry, especially since her long-term career goal is to work in the field of art and art history. How did this opportunity with the Whitney Museum come about for you? I was selected as a participant in the College’s Career Center Internship Award program. That program provides professional development training to help students plan, apply and gain summer internships. As part of the program, Jim Allison, executive director of the College’s Career Center, helped me polish my résumé, write cover letters and practice interviewing. In addition, my professors and mentors in both the art history department and the arts management program gave me feedback on the essay portion of the Whitney’s internship application. All of that was tremendously helpful in ensuring that I could submit a strong application. What was it that interested you in working at the Whitney? Serving in an internship at the Whitney Museum of American Art will be a tremendously valuable experience. It will be formative in my aspiring career as a museum professional and in pursuing a graduate degree in Latin American art history. My interests within the broader art history canon lie in the study and research of American art, specifically focusing on Latin American art history. I am especially interested in how Latinos and their art fit in with the larger culture of the arts industry, i.e. how they are exhibited and critiqued, their leadership positions, and how they tackle the ever-growing concept of identity within the modern-day context. It’s well known that the Whitney’s mission is to celebrate the artistic accomplishments of diverse artists and provide them with a platform that is desperately needed in this era. As a Latina, I see the value and importance of supporting a diverse set of artists in the critical moments of their careers. It’s important to exhibit artists who are able to open a dialogue to new ideas, and who can truly embrace that a museum of American art is home to a wide range of individuals. 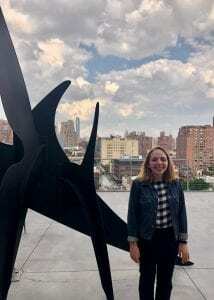 For me, the Whitney offers one of the best models for celebrating more inclusivity and diversity in the arts, and that’s really why I applied for this internship program. Being able to immerse myself in an institution that truly celebrates the art of all of the Americas, well, that’s a place where I would feel proud to continue growing technically and professionally. The Whitney internship will allow me to further develop the skills that I gained from previous internships and professional experiences. I interned at the Gibbes Museum in Charleston, and that is what solidified my passion for wanting to work in this industry. I also hope that I’ll have the opportunity to further study and assist in the preservation of American art during my time in New York. I also interned at the Halsey Institute of Contemporary Art on campus, and that’s where I was first exposed to the process of curating exhibitions, managing databases, and participating in the installation and de-installation of exhibits. That experience exposed me to the leadership, teamwork and communication skills that are required in this work. I expect that my time at the Whitney will help me hone those skills. So what exactly are the duties you have for this internship? As a research and interpretation intern, I work in the museum’s education department. I’m responsible for assisting with the digital media collaborations, some of the material interpretation and some of the exhibition research. My biggest project so far has been assisting in the creation of audio guides and videos for a couple of upcoming exhibitions, including David Wojnarowics: History Keeps Me Awake At Night; Pacha, Llaqta, Wasichay: Indigenous Space, Modern Architecture, New Art, and The Face in the Moon: Drawings and Prints by Louise Nevelson. This process has allowed me to engage intimately with the artists, voice actors and curators. My work has also been focused on developing the introductory wall labels. Within this department, it’s our job to select, research and craft the labels for each exhibition and each piece. What do you like most about working at the Whitney Museum? One of the most valuable moments for me is seeing the hard work that I put in every day translate into a finished product. Recently, the audio guides for David Wojnarowics’ exhibit and Pacha, Llaqta, Wasichay: Indigenous Space, Modern Architecture, New Art were finalized, and soon museum goers will be able access content that I had a hand in creating. It’s really rewarding to see how much my supervisors value my opinion and how they let me get deeply involved in the audio guide creation process. But perhaps my favorite thing about this internship is the speaker series that we attend every Thursday morning. This is a way for us to see a holistic picture of what it takes to run a museum and the ways that other departments at the Whitney operate. In this internship program, they really push us to make connections and network with other employees of the museum and the graduate fellows. The mentorship program set up by the Whitney is a good example of this. My mentor is Marcela Guerrero, an assistant curator at the Whitney and a scholar of Latin American art history. She has given me insight into the professional field of curating from the point of view of a Latina woman. It’s been inspiring. Article by Dan Dickison. For more on this story, check out The College Today! Follow us on social media to stay up to date with Honors College news!